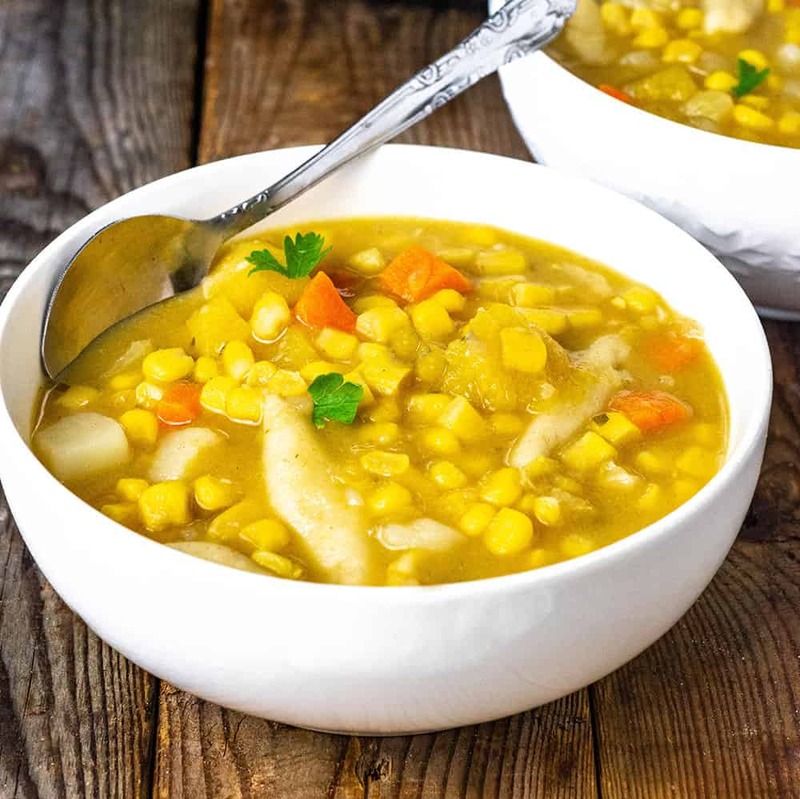 This Corn Soup Recipe is bursting with flavors and is easy to prepare. 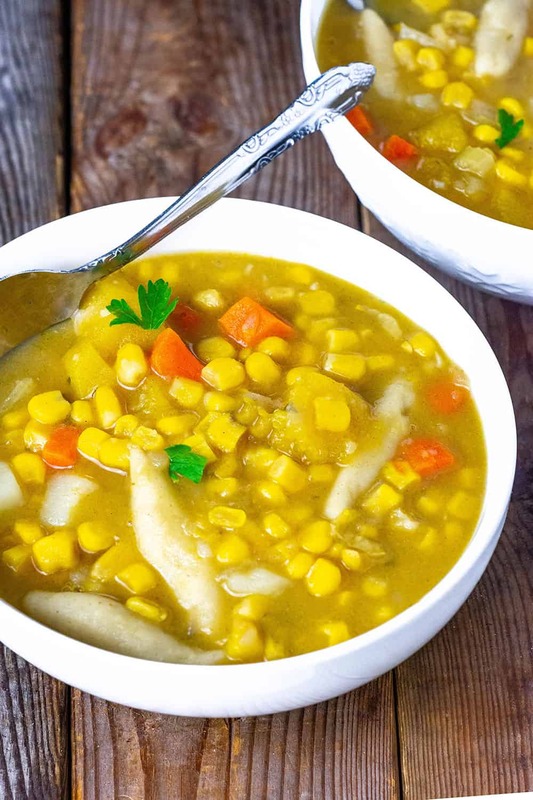 Sweet Corn, potato, carrots, butternut squash, and dumplings are cooked in a flavorful broth for a warm, hearty and comforting soup. 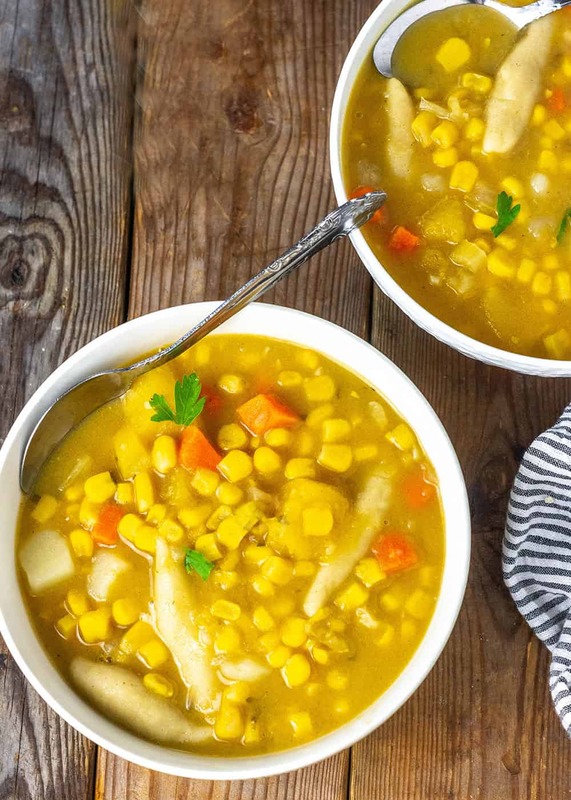 I have been in the mood lately for corn soup after recently making Venezuelan Arepas and Corn Bread. 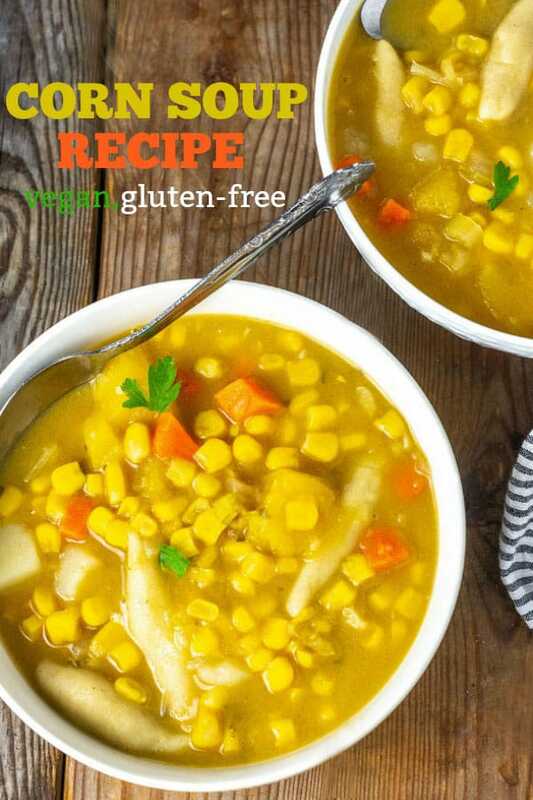 I wanted a vegan soup recipe that was perfect for fall/winter. The addition of diced butternut squash. potatoes, carrots, and dumpling made it robust for the cold. 1. Use fresh or frozen corn., whichever you had on hand. 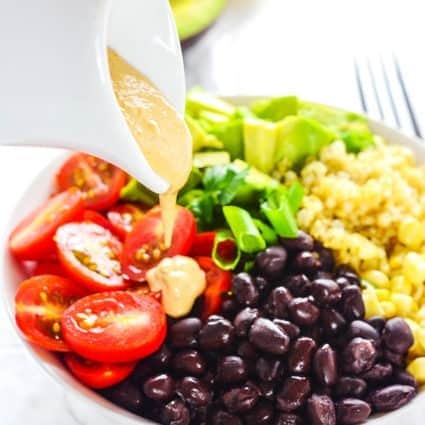 Frozen corn is much easier to use and you can enjoy this recipe all year round using frozen corn. 2. 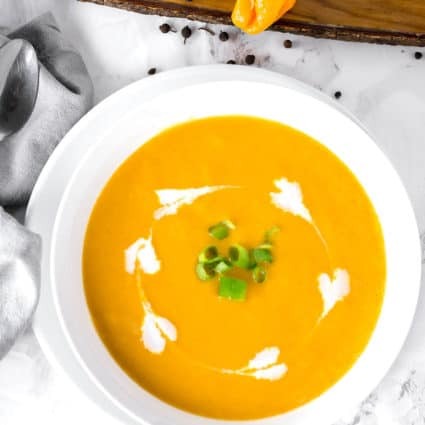 Use vegetable broth or 2 vegetable bouillon plus 3 cups of water for a flavorful soup. Add salt to taste. 3. For a creamy soup, add coconut milk. My family enjoyed this recipe so much, it was all gone when I served it. Heat oil in a large pot, add onion, garlic, and celery, cook stirring until onion is soft about 3 minutes. Add parsley, thyme, cumin, butternut squash, carrot, potato, corn and cook stirring for a minute. Add vegetable broth, coconut milk, cayenne pepper and bring to a boil for about 5 minutes. Meanwhile, prepare the dumplings. Add flour and salt into a medium bowl, add water to form a dough, break off pieces and roll between the palm of the hands to form a cylinder. Drop dumplings in boiling soup and repeat until dough is all gone. Cover pot and reduce heat to simmer for about 15-20 minutes or until you have the desired thickness. Add salt to taste. 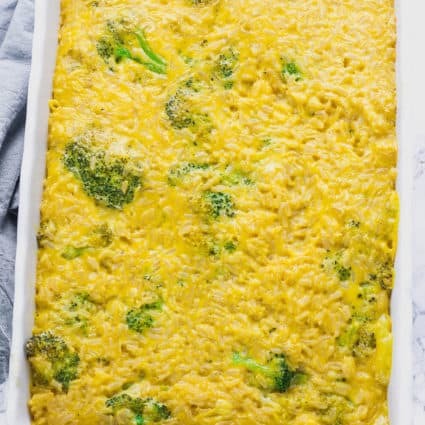 Hi Michelle, how do l adapt this recipe to make in a 6 quart instant pot? Thanks! Zory I haven’t done it as yet. Made it in instant pot, sautéed onion, garlic and celery. Then dumped everything else in there, added salt, onion and garlic powder with other herbs, left out cayenne. I cooked for 10 minutes on high pressure and natural release for 10 minutes more then did a quick release. Pretty much followed the timing for the instant pot curry potatoes. It was really good, every loved it! I really appreciate how your recipes are pretty accurate and don’t need much adjustments. I can usually adjust to our liking very easily. Thanks! This recipe is absolutely amazing! My cousin and my husband loved it so much that I made another batch, so it would be plenty for us to have for lunch and/or dinner the next day. I will definitely make this soup again. Charnele, I’m so happy you and your husband enjoyed it. I made it two days in a row as well. Thank you for your feedback. This soup was a hit!!! I made it for my husband and my cousin who are both meat eaters. They absolutely loved it and asked me to make another batch. 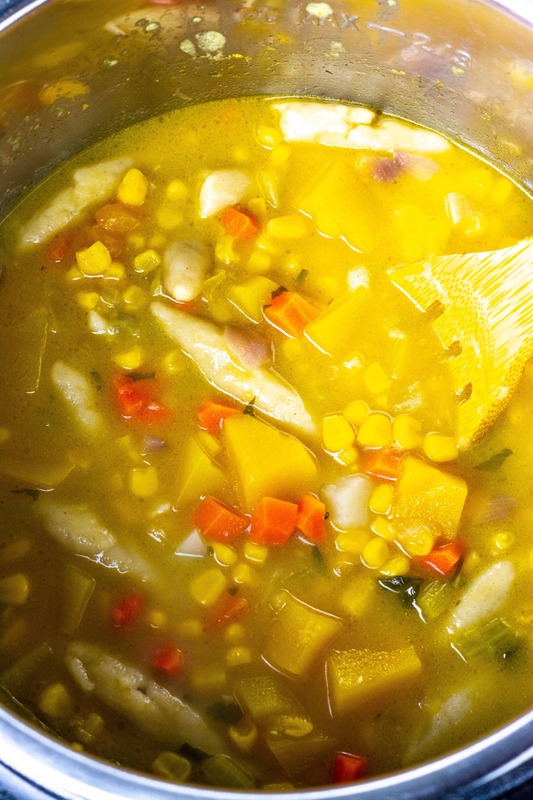 We are all having leftovers of this soup for lunch today and I am sure I will have it for Dinner as well. I will definitely be making this more often.